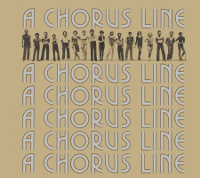 As a reissue producer, I have worked on a lot of recordings produced with the methods that prevailed at the time they were made, but nowhere was the span of 50-odd years in recording techniques more surprising to me than in those two extremes in the Broadway cast album catalog – Kiss Me, Kate (1948) and A Chorus Line (1976). One of the earliest Broadway cast albums in the Columbia catalog, Kiss Me, Kate was recorded direct-to-disc in January 1949. Transfers to tape had been done later on but tampered so much with the sound itself that my engineer and I decided to go back to the discs in order to have sonics as close to the original studio sound as possible. From the first bars of the “Overture,” clear and brassy, we knew we were on the right track. Going back to the discs also meant that we had to de-tick and de-noise to remove all those obtrusive little sound buggers that somewhat disappeared when vinyl reigned, but which have a tendency to appear much louder than they should in the digital mode. 1949 was also the year the transition from disc to tape occurred. Studio engineers had been working on developing a recording medium more flexible than the cumbersome acetates that were used at the time, and they were also getting ready to present their latest innovation in recorded sound, the long-playing album. The Broadway cast album that did the trick in both cases was South Pacific. It was recorded simultaneously on disc and on mylar tape, though apparently not so simultaneously after all, because there are several discrepancies in some of the vocals in both, and it was released in the new microgroove long-playing album which contained the entire show on two sides, as opposed to the multiple bulky 78 discs that were the norm until then. Over the years, I worked on several reissues of this classic Rodgers and Hammerstein musical, but I don’t remember where we used the disc version and where the tape. All I can say is that our goal each time was to try and improve the sound quality to make the recording more vivid, to give it more “presence.” Ezio Pinza’s “Some Enchanted Evening” helped a lot – it became the parameter by which we measured the kind of sound we wanted to obtain. Big, resonant, and lush. Surprisingly, shortly after having dealt with Mary Martin in South Pacific, I found her again at RCA (and on tape!) in the cast album of Peter Pan. Five years after the “Tales of the South Pacific” spin-off, she was still magnificent, at the top of her game, and something of a Peter Pan herself, an image she would carry for the better part of her career. As the quality of the recording techniques improved over the years, we worked on cast albums that gave us many hours of priceless joys, like Kismet, The Pajama Game and My Fair Lady, all recorded in almost pristine mono sound. But a new era was approaching – stereo! Initially, stereo recordings, introduced in 1956, were done on two-track tapes which, like the mono tapes, were simple to handle – all we had to do was to play the tapes! But that format lasted a mere two years before three-track recording methods became the norm. Now, we were faced with a new challenge. Suddenly, we could remix, we could change the levels between the singer(s) and the orchestra. Better yet, we could correct some of the minor flaws that might have existed in the original recordings. And as we plodded along, we also hoped we might find the ultimate – a bonus track no one had ever heard before, perhaps an entirely new song, though we would have settled for anything, even a fragment of song that might have been left out. Another recording that was great to work on using the original session tapes was Oliver! though production proved difficult. It had been recorded on the West Coast, prior to its premiere on Broadway, and the engineers in California had overloaded the sound to the point where it was occasionally distorted. With the equipment we had at the time I produced that reissue, there was very little we could do, except be frustrated by our lack of resources. We could send a man to the moon, but we seemed unable to control saturation on a tape. Jon Samuels, who produced the 2003 reissue, probably faced the same problems, but technology had made substantial steps forward in less than 10 years, and his work sounds significantly better as a result. From three-track, the industry progressed again, and by the time A Chorus Line was recorded in 1976 it was on sixteen-track tapes, something that enabled the reissue of the album to be larger and perhaps better than when it was first released. Our goal was to add whatever previously unreleased fragments of songs we could find, and we did. We also reduced the heavy reverb that had been added to the original release, and returned to a more natural sound. And I think it worked. But my greatest joy was when I was asked to prepare another reissue of the cast album, a couple of years later, this time in 5.1 surround. Creative juices began to flow. Now, there was a real challenge. Not only were we going to reissue that seminal cast album in widespread stereo but in 3D, so to speak. With my engineer, we began to devise an aural approach that would emphasize the three-dimensional effect. We finally settled on two specific moments in the cast album – in the first scene, Zach, the director auditioning the actors and actresses onstage, would be heard behind the listener. And in the last number, “One,” the cast would be filing in from behind and past the listener to arrive upfront. The 3D effect in the other tracks would be provided by a muted slap of the sound behind the listener, as it would be in a theater. It was exciting, it was new, it was theatrical! It was never released! Before it was scheduled to come out, 5.1 was discontinued and industry norms returned to plain old stereo. Ah, well… that’s show biz! Producer Didier C. Deutsch lists Broadway show tunes among his most favorite musical genres, which is why, when given the first opportunity, he began working on reissuing cast albums and creating theater tune compilations, producing more titles in that field than in any of the others in which he has been involved. He is also a theater critic who has been published in a wide range of magazines and newspapers, and, in that capacity, has covered Broadway openings for more than 45 years.